Barry Markowitz THAT’S NOT HOW IT HAPPENED! Saturday, August 30, 7:00 pm. 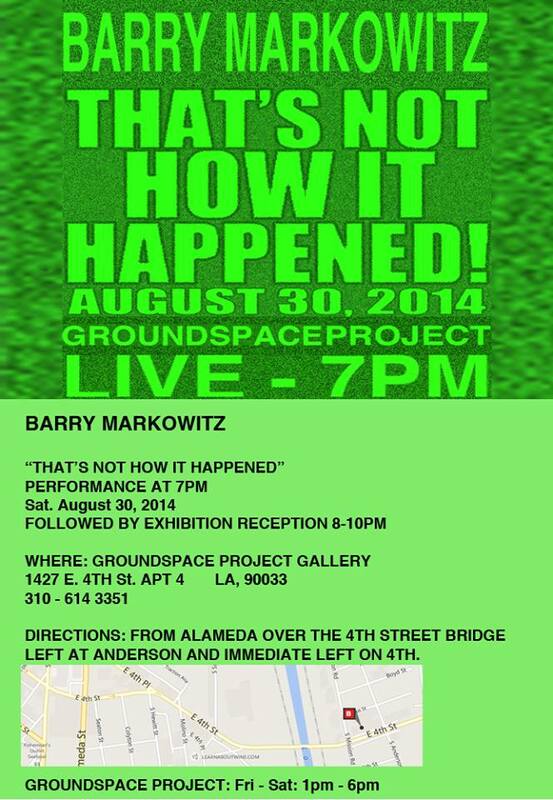 Please join us for Barry Markowitz’s performance THAT’S NOT HOW IT HAPPENED! Saturday, August 30 at 7:00 pm. Reception following 8:00 to 10:00 pm. Mr. Markowitz was born and raised in Brooklyn NY. He received his MFA from California State University, Los Angeles. Additionally, he has studied at UCSB, CSUN, The Art Students League in New York City, Nassau College and the School of Art and Design in New York. His awards and honors include a General Motors Grant, two Rockefeller Honorariums and a artists fellowship from the California Community Foundation /J. Paul Getty Trust. His work has been shown in exhibitions at the Whitney Museum in New York, The Regional Museum in Guadalajara, Mexico, J Paul Getty Museum, The Southwest Museum and The Museum of Santa Cruz County. In 2011 Mr. Markowitz’s Performance work was included in the J. Paul Getty PST initiative at L.A.C.E and HRLA. His work is in the collection of Balthazar and Rosetta Getty, The J. Paul Getty Museum, Paramount Pictures and Leonardo Dicaprio. The work I have made for this show covers many of my Performances from 1974 through 2012. I have fashioned a number of photographic montages, motifs and single images to represent this work. These photomontages are accompanied by sound montage and in some cases written notation, scripts and doodles have been added. My Performances tread the line between Art and Theater. They are not linear in construction; on the contrary my work relies on physical actions and intertwining streams of memory and fiction. In this new work about memory and remembering, I have fashioned a loose framework of timed movements, sound augmentation, projections and live characterizations.